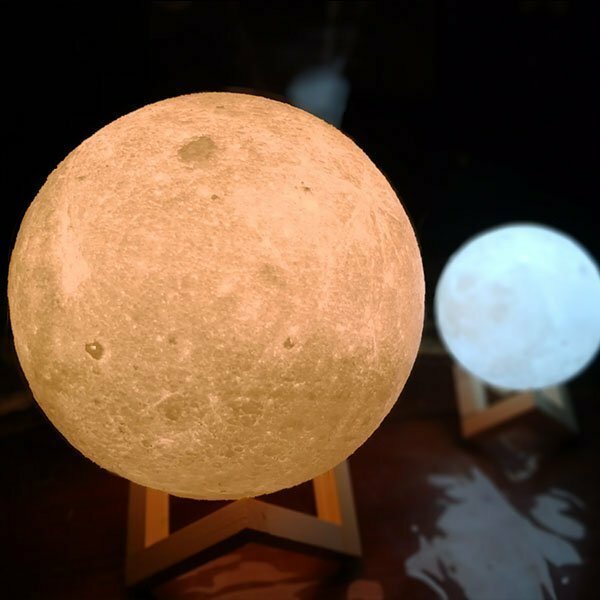 Our Moon Lamps use the most cutting edge 3D printing technology to print layer by layer, and create the most beautiful and realistic appearance of the moon. Our moon releases enchanting ambient light with both options of warm and cool white light. 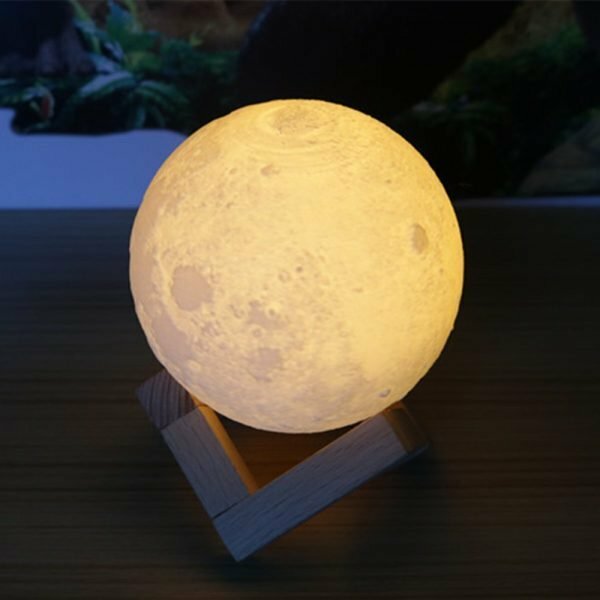 Our Moon Lamps come with a simple to use charging port and on / off switch integration. We use the latest warm and non heating LED’s so that it is always safe and cool to touch while providing a memorising light. Our lights are safe to hold in your hand and look great inside their wooden display holder. 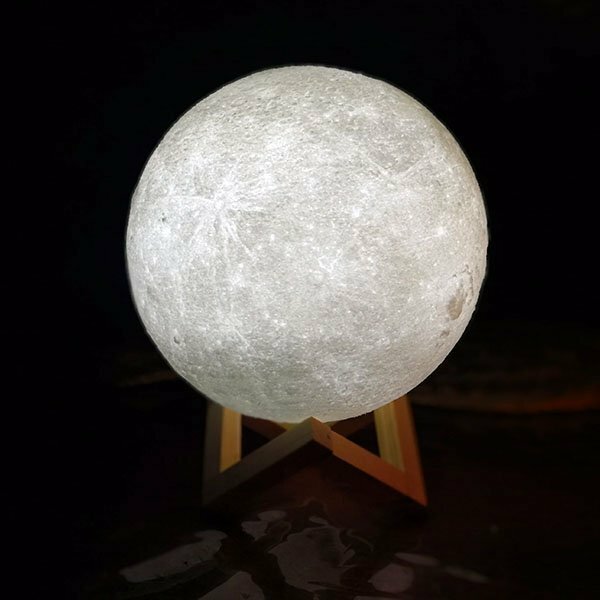 All moon lamps are made with safe and environmentally friendly PLA material extracted from corn stalks, hard and smooth, non-toxic, and odourless. 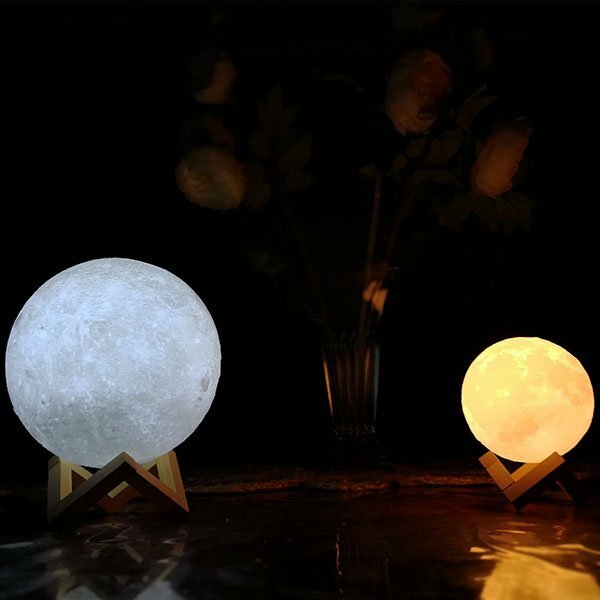 Our moon lamps have an in built long lasting 240mAh built-in battery so that after the full charge, the lamp can be used between 8 – 30 hours. A full charge takes about 6 – 8 hours. A perfect gift: Express your love with this warm gift of beauty and uniqueness. Perfect for the bedroom, a child’s room, living room, bar, man cave, shop, café or restaurant or even your business! Your kids or loved ones wont be able to resist this charming light. It’s also a great decoration for your home. 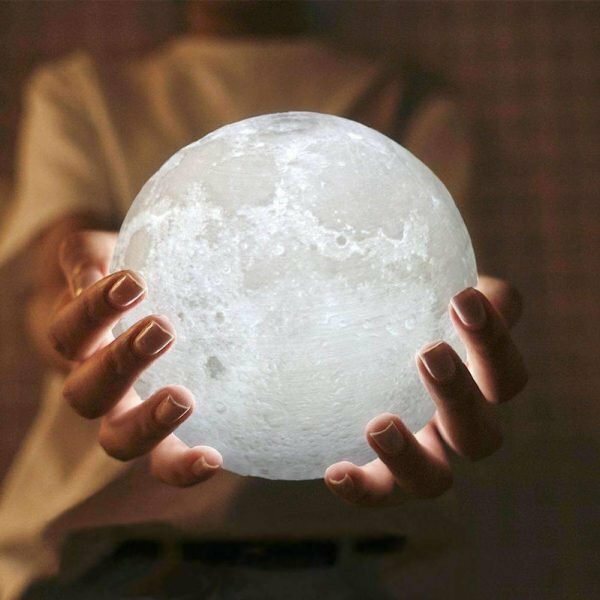 We sell the original & best moon lamps in Australia, don’t be fooled by cheaper, smaller versions! 1. 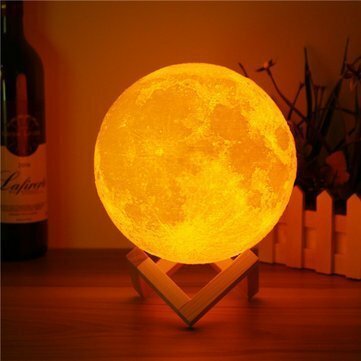 Touch the metal ring at the bottom of the moon lamp to turn on / off the light and to change colour from white to yellow. 2. Press and hold the metal ring to adjust brightness. 3. The white light will not shine when power is low. 4. Insert the DC connector into the metal ring at the bottom of the moon lamp to charge. 5. The red light will turn on when charging. Very happy with the moon light. Its beautiful and fun to play with. Me and my husband love it, and even our 2yr old girl love it. The only problem is, I should have choose the big 20cm size. Will buy it soon and give this one to our little princess. I got this moon as a nightlight for my toddler in an attempt to get him to sleep in his own bed/room. He loves it – and he loves turning it on all by himself. It’s really bright and has two different colours – a soft white and a bright white. It charges really fast too! We leave it on all night long, so we do have to plug it in to recharge it every other day or so. I wish the charge lasted longer or that we could use it while plugged in instead because I forget to charge it sometimes. This moon is going to get a lot of use in the next few years! I am so surprised that it looks so magical and mesmerising. I did not expect it to be so beautiful. This is now part of my favourite art corner. Next goal is to buy the biggest moon. I was looking for some kind of nightlight that I could put on my table beside my bed. I wanted something I could look at while listening to my relaxing sleeping music. So I wanted it to be relaxing too! I’ve tried the stares and moons on the ceiling and that was to busy for me. 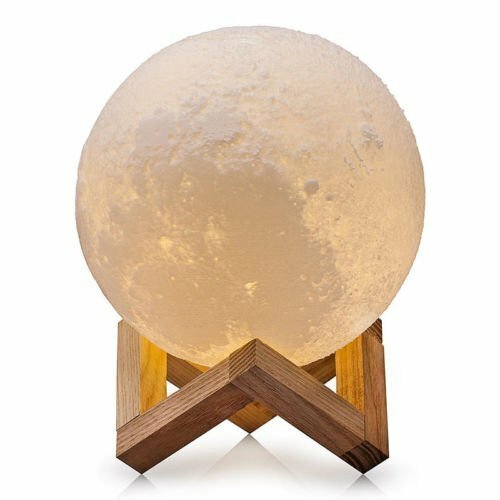 I found this Moon Lamp to be just perfect. It has two different settings a brighter white light and a low soft yellow light. The texture of the ball makes it look so realistic just like the moon to me that in itself is very relaxing. It comes with a USB cord for charging and the charge has lasted me 2 nights of six hours of sleep. It is has a sensor that is activated by your touch which I really like. I’m very happy with this product and would not have a problem recommending it to family and friends. Well… a nice replica anyway. It’s the simple things that add quality to life. A softly glowing handful of moon greets me before bedtime every evening. A little touch knob controls the brightness (just hold it for a couple of seconds) or changes between bright white and soft red. 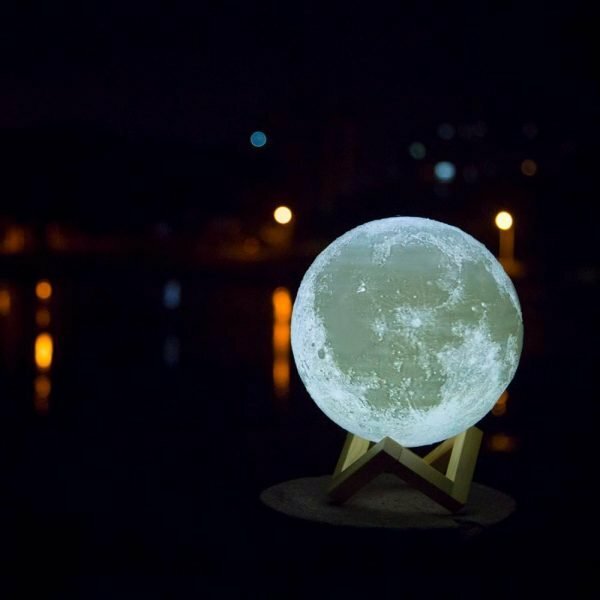 An easy to assemble wooden block tripod holds it in place so your moon won’t wander while you sleep. The interior glow is self-powered; when its glow goes dim, simply recharge using the included USB cable. As you drift off to dreamland, you can remember that old childhood book…. Good night moon.